7-year-old Daniel Barden was one of 20 schoolchildren killed at Sandy Hook Elementary School in December 2012. His parents – Jackie and Mark – live in Newtown, CT, with their two children. Jackie is an elementary school teacher and Mark is a jazz guitarist. Following the mass shooting at Sandy Hook, Jackie and Mark frequently traveled to Washington, D.C., to urge Senators to pass a universal background check bill. Mark is the founder and managing director of Sandy Hook Promise, a non-profit organization that focuses on preventing gun violence before it happens by delivering and advocating for mental health and wellness early-intervention programs, gun safety storage practices, and sensible state and federal policy. Jackie and Mark also run the What Would Daniel Do Foundation, with the mission to inspire and empower every person to act with kindness in order to make a positive cultural change. Gabrielle Giffords was one of 19 people shot in a mass shooting outside a Safeway grocery store in Tucson, Arizona, in January 2011. Six people were killed. At the time of the attack, U.S. Representative Giffords (D-AZ) was holding a meeting with constituents. She was shot in the head at point-blank range and lives with injuries that affect her speech and mobility. She resigned her congressional seat in 2012 to focus on her recovery. 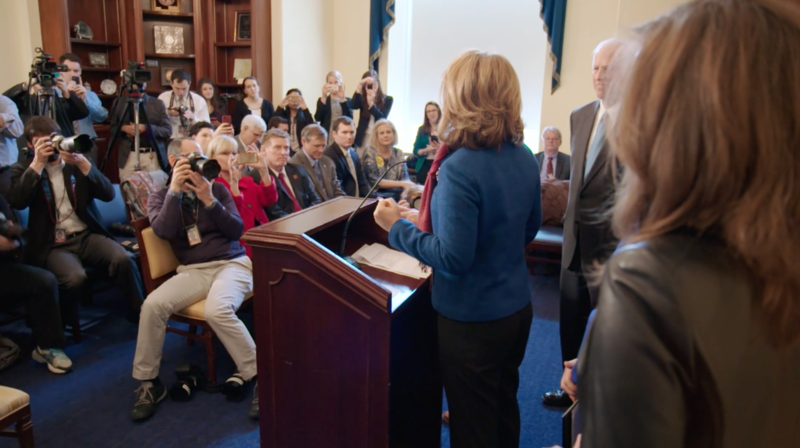 Along with her husband, retired Navy Captain and astronaut Mark Kelly, Giffords launched the organization Americans for Responsible Solutions to encourage elected officials to stand up for solutions to prevent gun violence and protect responsible gun ownership. Its super PAC spent $19 million in the 2014 elections. 20-year-old Christopher Ross Michaels-Martinez was one of six people shot and killed in the Isla Vista rampage in May 2014 near the campus of UC Santa Barbara, where he was an English major. 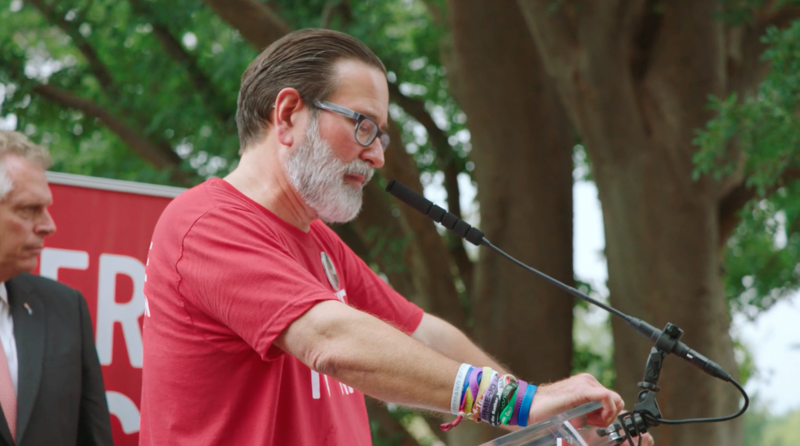 Since then, his father Richard has been traveling the country speaking out in support of common sense gun laws and carrying forward his message that “Not One More” American should be killed by senseless gun violence - a phrase he coined in the days immediately after his son’s death that sparked a national movement. Richard is a Senior Outreach Associate for Everytown for Gun Safety. 18-year-old Terrell Bosley was gunned down in the parking lot of a South Side Chicago church as he was bringing drums inside of a church, April 2006. His murder remains unsolved. Terrell was a college student and a gospel musician. Terrell’s parents, Pamela and Tom, who live in Rosemoor on the Far South Side of Chicago, have become outspoken voices against gun violence and are raising their two sons in one of the most violent areas of the city. 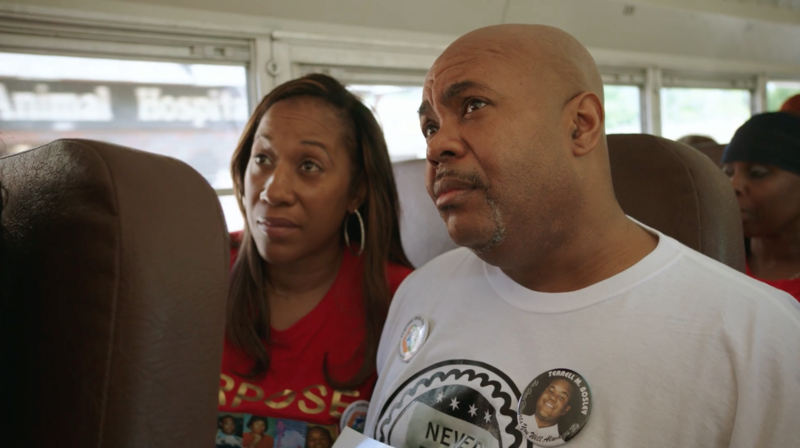 To cope with their loss of their child, Pamela and Tom founded THE TERRELL BOSLEY ANTI-VIOLENCE ASSOCIATION that provides Safe Haven Events for Youth, and they also are the co-founders of PURPOSE OVER PAIN, a group of Chicago parents whose children have all died due to everyday gun violence. These parents are now in pursuit of solutions to end senseless gun violence in communities while offering support to parents. The two non-for-profit organizations advocate for commonsense gun legislation. 24-year-old Jessica Ghawi was one of 12 people killed when a gunman opened fire during a midnight screening of the film The Dark Knight Rises in Aurora, Colorado, in July 2012. Jessi was an aspiring national sports reporter. Her parents, Sandy and Lonnie Phillips, who are both Republicans and gun owners, have become outspoken activists for gun violence prevention since Jessi’s murder. Their non-profit organization Jessi’s Message allows them to take their trailer and travel the country telling their story and working with fellow victims and survivors to advocate for common sense gun laws. Shannon Watts is a mother of five who, prior to founding Moms Demand Action, was a stay-at-home mom and former communications executive. The day after the Sandy Hook tragedy, Shannon started a Facebook group with the message that all Americans can and should do more to reduce gun violence. The online conversation turned into a grassroots movement of American mothers fighting for public safety measures that respect the Second Amendment and protect people from gun violence. 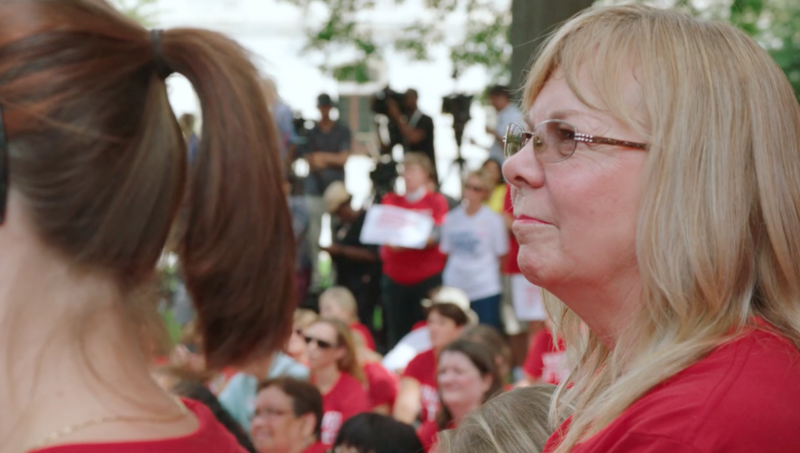 Moms Demand Action has established a chapter in every state of the country and is part of Everytown for Gun Safety, the largest gun violence prevention organization in the country, with more than three million members. U.S. Congresswoman Robin Kelly (D) represents Illinois’ 2nd Congressional District, which includes the South Side of Chicago and other areas that have been plagued by shooting deaths. Since her election in 2013, she has worked to promote public safety, sponsoring numerous bills to end gun violence. In 2014, Rep. Kelly released the Kelly Report on Gun Violence in America, the first-ever Congressional analysis of the nation’s gun violence epidemic that offers a blueprint for solving the crisis. The report brought together members of Congress, academics, and gun reform advocates to examine the root causes of gun violence in America and its impact, as well as to provide a comprehensive set of legislative and policy recommendations to stop it. Richard Feldman was a regional political director for the National Rifle Association during its rise to power in the 1980s. In the 1990s, he was chief lobbyist and spokesman for the firearm industry’s national trade association. He is the author of Ricochet: Confessions of a Gun Lobbyist (2008). Kaile Shilling is the former executive director of the Violence Prevention Coalition of Greater Los Angeles, which is a leader in the movement to frame violence as a public health issue, rather than a criminal justice issue. VPC’s mission is to unify and strengthen voices of member organizations and individuals committed to ending the epidemic of violence by providing education, resources, and public policy. Kaile has more than a decade of experience working in and with nonprofits, and prior to joining VPC, she worked at Homeboy Industries, one of the leading gang intervention agencies in the nation. Former U.S. Congresswoman Carolyn McCarthy served nine terms representing New York’s 4th Congressional District. Personal tragedy compelled her to run for Congress and make gun reform her primary legislative goal. In 1993, her husband Dennis was killed and her son Kevin injured when a gunman opened fire with a semiautomatic pistol on an evening rush hour Long Island commuter train. During her tenure, she was known as the “doyenne of anti-gun advocates in the House” and sponsored multiple gun bills, including improved reporting of mental health records into the NICS system, a ban on assault weapons, and trigger locks on guns. Rep. McCarthy (D) recently retired, at age 70, after serving 18 years in Washington, D.C.
Arkadi Gerney is the Senior Vice President of Campaigns and Strategies for the Center of American Progress Action Fund and a Senior Vice President at the Center for American Progress. Prior to joining CAP, Gerney worked as special advisor and first deputy criminal justice coordinator to New York City Mayor Michael Bloomberg, where he managed Mayors Against Illegal Guns. During his time there, Gerney oversaw the coalition’s growth to more than 600 mayors, led successful campaigns to influence federal legislation, partnered with Wal-Mart to develop a landmark gun-seller code of conduct, and led New York City’s undercover investigation of out-of-state gun shows. In 1987, Gerney’s life was profoundly changed when his mother’s fiancé was fatally shot in the head with a sawed-off .22-calibre rifle. Josh Sugarmann, a native of Newtown, Connecticut, founded the Violence Policy Center in 1988. The VPC informs the public about the impact of gun violence on their daily lives, exposes the profit-driven marketing and lobbying activities of the firearm industry and gun lobby, offers unique technical expertise to policymakers, organizations, and advocates on the federal, state, and local levels, and works for policy changes that save lives. Dr. Daniel Webster is the director of the Johns Hopkins Center for Gun Policy and Research and professor of health policy and management at the Johns Hopkins Bloomberg School of Public Health. He also serves as the deputy director for research at the Johns Hopkins Center for the Prevention of Youth Violence. As one of the nation’s leading experts on firearm policy and the prevention of gun violence, Dr. Webster has published numerous policy articles and has studied the effects of a variety of violence prevention interventions, including state gun and alcohol policies, public education campaigns, and policing strategies. He is the co-editor of Reducing Gun Violence in America: Informing Policy with Evidence and Analysis (2013). Dr. Robert Spitzer is a Distinguished Service Professor and chair of the political science department at the State University of New York, College at Cortland. He is the author of five books on guns, including his most recent Guns Across America: Reconciling Gun Rules and Rights (2015) and The Politics of Gun Control (6th ed., 2015). Dr. Spitzer served as president of the Presidency Research Group of the American Political Science Association from 2001-2003 and as a member of the New York State Commission on the Bicentennial of the U.S. Constitution. Dan Gross has been the president of the Brady Campaign to Prevent Gun Violence since February 2012. He became involved in the gun violence prevention movement after his brother Matthew was severely wounded in a shooting atop the Empire State Building in 1997. Before joining Brady, he co-founded and directed the Center to Prevent Youth Violence, where he created and implemented the ASK Campaign and Speak Up Program, which continue today at the Brady Campaign. Following the Newtown massacre, Dan served on Vice President Joe Biden’s gun violence prevention task force. Under Dan’s leadership, the Brady Campaign – a passion project of his late close friends Jim and Sarah Brady – has announced the bold goal of cutting the number of U.S. gun deaths in half by 2025. Charles Houser is the chief of the National Tracing Center Division of the Bureau of Alcohol, Tobacco, Firearms, and Explosives. The National Tracing Center in Martinsburg, West Virginia, is the country’s only facility that tracks firearms from manufacturer to purchaser. In 2014, Houser and his team traced nearly 365,000 firearms recovered from crime scenes, providing investigative leads for federal, state, local, and international law enforcement agencies. John Feinblatt is the President of Everytown for Gun Safety, the largest gun violence prevention organization in the country. He is a senior advisor to former Mayor Michael R. Bloomberg and, in addition to his role at Everytown, has led the former mayor’s efforts on immigration reform, infrastructure investment, and marriage equality. During the twelve years of the Bloomberg administration, Mr. Feinblatt held the position of New York City’s Criminal Justice Coordinator and in 2010 was appointed the Mayor’s Chief Policy Advisor. Prior to joining City Hall, Mr. Feinblatt was the Founding Director of the Center for Court Innovation and the Founding Director of the Midtown Community Court. Mr. Feinblatt is a graduate of Wesleyan University and the Columbus School of Law at Catholic University. He lives in New York City with his husband and two daughters. See full list of experts and survivors featured in the film on The Credits page.